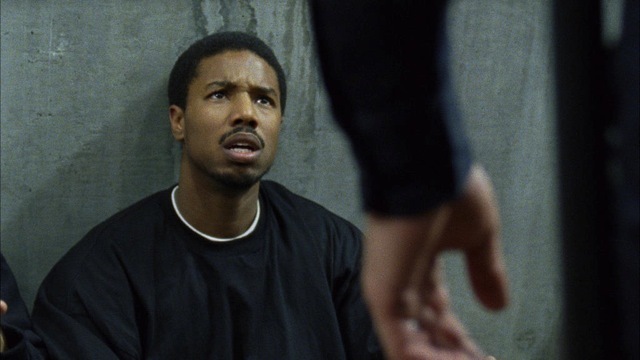 Michael B. Jordan in Fruitvale Station. If you don’t live in the San Francisco Bay Area, you might only know the rudiments of this tragic event and subsequent upheaval: Black man, in handcuffs, shot in back by White police officer in Bay Area Rapid Transit train station. Protests. Riots. Unrest. This thoughtful, methodical and contemporary allegory, which is based on a true story, carries the weight of a Greek Tragedy. The film reveals as much about the incident as it does about our complex attitudes towards race. Oscar Grant (Michael B. Jordan), an aimless 22-year-old, lives in the East Bay. He has not lived a perfect life. Done a little time for a little crime. Fathered a daughter, Tatiana (Ariana Neal), out of wedlock with his Latina girlfriend Sophina (Melonie Diaz). Lost his job because he couldn’t show up on time. He’s dabbled in drug dealing and has a hair-trigger temper he’s learning to control. On the other hand, he loves his daughter. Has a strong relationship with his tough-love mom Wanda (Octavia Spencer). Is buoyed by his extended family. His sister wants to borrow money, and though he is dead broke, he tries to help. And his heart is in the right place the day a stray dog is hit by a car and he carries it to the side of road as if it was his own. It’s 2008. December 31st, New Year’s Eve. Seems like Oscar is finally focusing on finding a job, being faithful to Sophina and leaving his drug life behind. He’s got a new attitude and great expectations for 2009. Just one more night on the town, what could it hurt? He, his buddies and Sophina plan to head into San Francisco for the festivities. Oakland born writer/director Ryan Coogler, whose previous credits include short films, takes a big step into the feature film world with this ambitious, well-realized urban drama. His script lays the blueprint. It’s perfectly detailed. With deftness he sets Oscar’s persona in cement. You know he’s an imperfect human being. Neither a saint nor a sinner. He’s a son without a father, an adolescent struggling with direction. Think Tupac. Think of the kid down the street. He’s surrounded by love (mom, Sophina, Tatiana, various uncles). He’s equally courted by crime, drugs and gang violence. His choices are crucial; the difference between life and death. The other character Coogler develops with great success is Wanda; a mom who doles out her love and acceptance balanced with strict parental discipline. One of the film’s strongest moments is a prison visiting room scene when Oscar gets in a tiff with a fellow con who rankles him. The two young bulls paw the ground and are ready to ram heads when mom takes control. She gets up and leaves, “I’m not coming here again. If you want to put yourself through this…Not me.” And she doesn’t return. Coogler’s direction is steeped in realism. No New Jack City swing. No Boyz ‘n The Hood melodrama. It feels like you’re wandering the streets of Oakland, aimless, searching for a clue to life. The interactions between the characters seem like everyday occurrences. Fights and make-ups with Sophina are normal as rain. Civil communications with White, Black and Latino people are routine. The death of Oscar Grant is unique because fellow passengers captured it on cell phones. Wisely, Coogler starts the film with some of that haunting footage. As the director leads you up to the film’s climax, you are hopeful, even though you know the inevitable. The filmmaking does have flaws: Sometimes the dialogue seems overly prophetic. On New Year’s Eve, Tatiana tells Oscar, “Don’t go, I’m scared for you.” If those words were actually said that night, so be it. In this film, they sound too contrived. Also the film ends abruptly, like it only gets to Act II. What happens after the incident is surly as significant and worthy of unveiling as what comes before it. How the subsequent protests, riots and demonstrations lead specifically to justice of any kind is the missing coda. Michael B. Jordon honed his talent on series like The Wire and Friday Night Lights. His performance seems natural but that doesn’t mean it was easy to achieve. It’s subtle, deep and fiery. Octavia Spencer is up to the challenge of playing mom. Her expressive eyes and amiable manner mix eloquently with a tough undercurrent. This brilliant, performance is the antithesis of her clownish, over-the-top portrayal in The Help. This should be her signature role. Under the guidance of cinematographer Rachel Morrison, the BART trains look like urban snakes, vipers speeding along tracks and devouring humans at each station. The costumes are unnoticeable (Aggie Guerard Rodgers) and that’s a compliment. The music doesn’t interfere (Ludwig Goransson). The production design (Hanna Beachler) exhibits low-income apartments and prisons with stark visuals. At that moment when words are said and irrevocable mistakes are made it’s a shocking, immensely disturbing experience. You will leave the theater emotionally devastated. Grief-stricken. Angry. It’s the mark of a very strong piece of filmmaking and a very sobering reminder that life can vanish in an instant.